You are the greatest. Like you, we are suffering from suddenly increasing prices, in a place where most expenses were already double what you see in the Lower 48. If you’ve been with us for a while, you know that the past half-year has been an especially difficult one for this mission, as we’ve struggled to keep current on our bills. It is you, by continuing prayer or by continuing financial help or both, who have kept the mission alive and well, serving many needs of remote western Alaskans, 24 hours a day. You have brought them the Mass, the Rosary, vital news, emergency information, education and inspiration. With your kind support, we will continue working hard for you. And we acknowledge that you are KNOM’s greatest strength. We thank you a thousand times, and we know that Our Heavenly Father will reward you a thousand times beyond that. God bless you for your generosity! 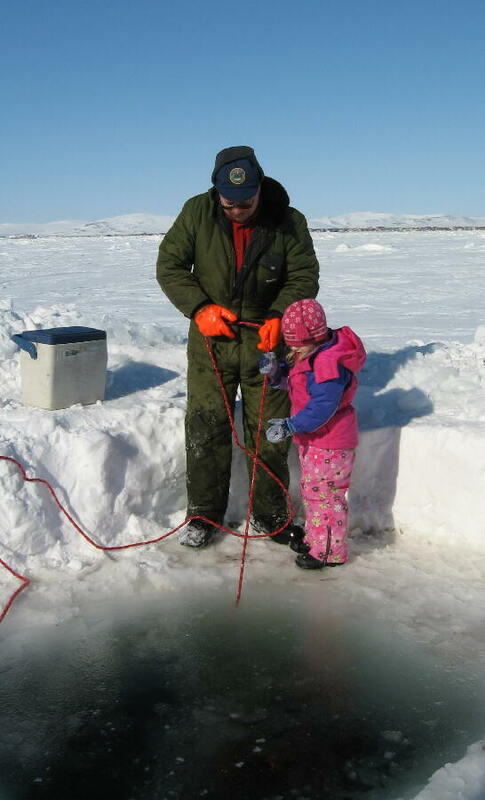 BY HOOK…(left) KNOMer Betsy Brennan’s husband Mike and daughter Sarah hook for crab through a hole in the Bering Sea ice. The dark line in the background is the town of Nome. 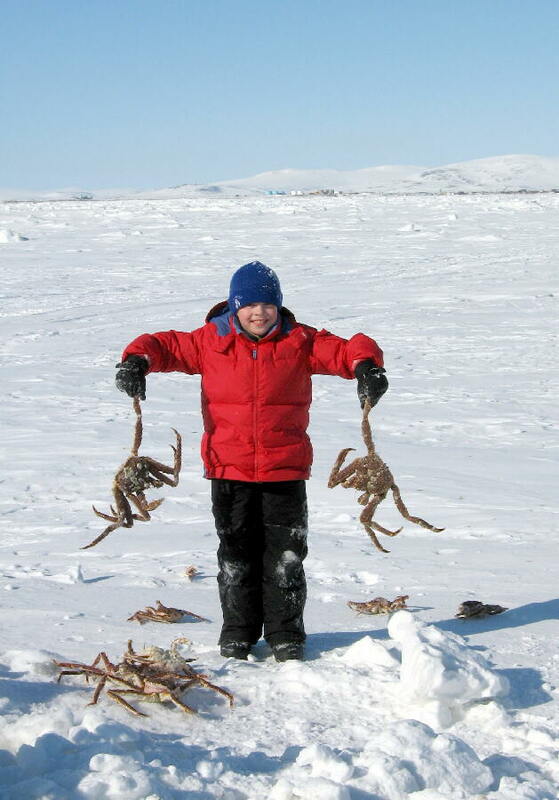 (Below, left) Betsy and Mike's son John shows off some of the day's catch. LET IT FLOE: Every year at this time, western Alaska’s rivers, streams and ocean ice melt. Sometimes, they break up catastrophically. Unimaginably gigantic jams of immense slabs of broken ice can dam a river for miles. Behind the dam, water can build up, tens of feet high on rivers like the Yukon, causing severe flooding. When a jam breaks, the combination of water and ice can cause great damage, and jams can form many times, in many places. That’s one more reason why you’ll find ears particularly glued to the KNOM signal for 100,000 square miles, as the KNOM news department broadcasts the Alaska breakup summary, detailing river conditions and forecasts. You’ll also routinely hear announcements from officials in villages, warning residents of where ice is particularly soft and treacherous for travel. It’s one great way that you help keep these incredibly remote families safe. Thank you! INSPIRATIONAL SPOT: Your love for God is no greater than your love for the least important person you know. 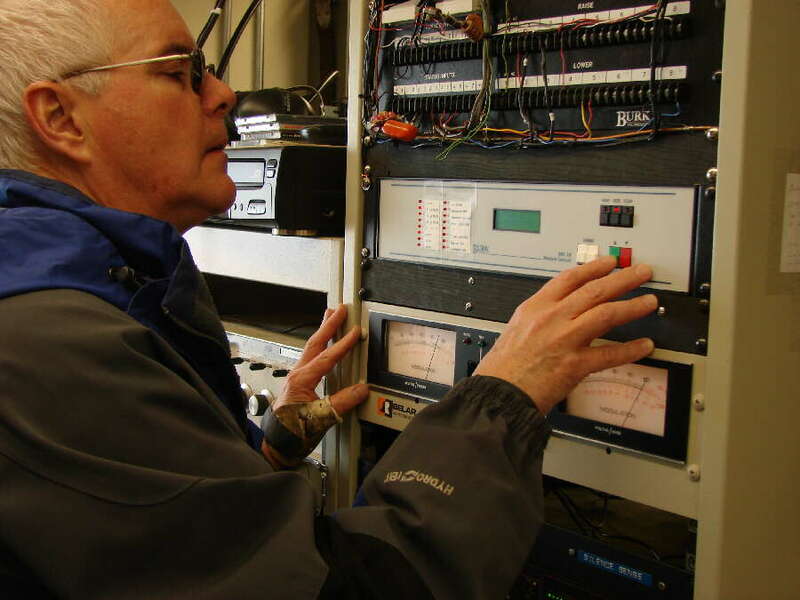 A REMOTE REMOTE: (left) At the isolated transmitter site, Tom Busch calibrates KNOM’s remote control. Via two-way microwave, the device allows the 25,000 Watt transmitter to be controlled and monitored from the studio. Tom, who is now KNOM’s financial officer living in Anchorage, served as the station’s first volunteer chief engineer in 1970, and was KNOM’s general manager between 1975 and 2005. For many years, he served on the Alaska Broadcasters Association’s board of directors, was elected its president twice, and was inducted into their Hall of Fame. These days, he flies to Nome about once a month. 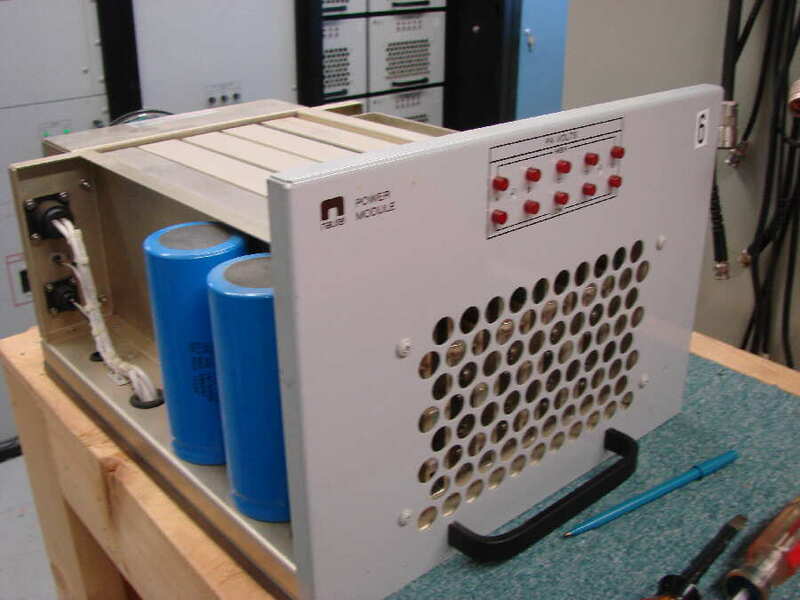 (Left) One of the transmitter's 12 power modules which requires annual inspection. (Below, left) The underside of each module has 48 bolts which must be checked for absolute tightness. 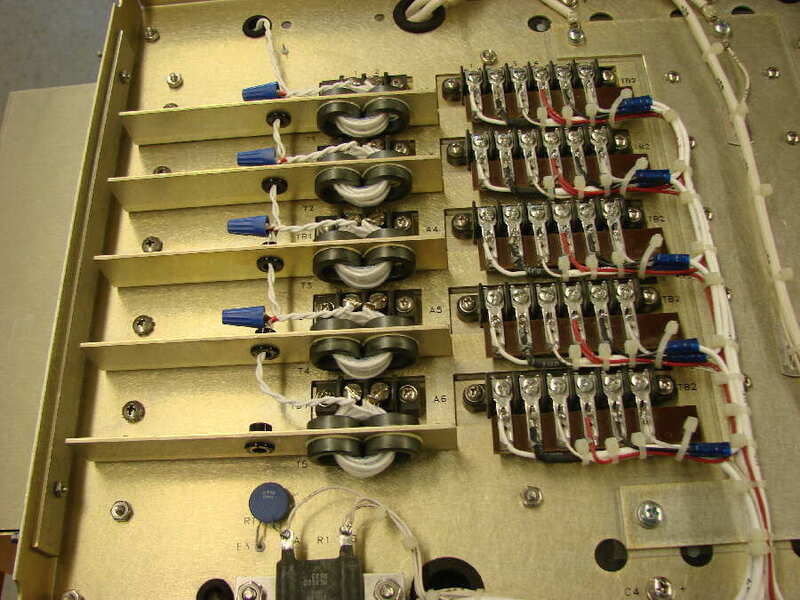 Overall, the transmitter has more than 700 such connections. “MAVERICK TEACHER BRIDGES DIGITAL DIVIDE,” read the headline on the front page of the Anchorage Daily News. The paper was talking about KNOM’s own Michael Warren, an award-winning middle school teacher who now lives in Anchorage. A graduate of Villanova University, Michael first came to Alaska in 1998 to volunteer for KNOM. Hurray, Michael! A TRUE STAR: With the ice still in, Nome folks were treated to the sight of the U.S. Coast Guard icebreaker Polar Star. The 400-foot vessel passed through Nome following two months studying ice seals. You can imagine that the mighty ship was a very impressive sight! IT’S THE GOSPEL: And you’ll hear it on KNOM. Each week, we repeatedly broadcast the Gospel reading for the upcoming Sunday. Thank you so very much for supporting this work. THANK YOU BY E-MAIL? An increasing number of our friends are asking us to save paper and postage by thanking them for their gifts via e-mail. If you’d like to take advantage of this feature, please let us know. LEGACY: If you haven’t already, please consider joining members of the KNOM staff and many KNOM supporters who have included this mission in their wills. For most of us, it will be the largest gift we are ever able to make, and can make a genuine difference in many lives for many years. INSPIRATIONAL SPOT: Christ helps us to face the music, even though we might not like the tune. INSPIRATIONAL SPOT: There are many wonderful things that will never be done if you do not do them. WHAT’S WITH THE WINDOW? 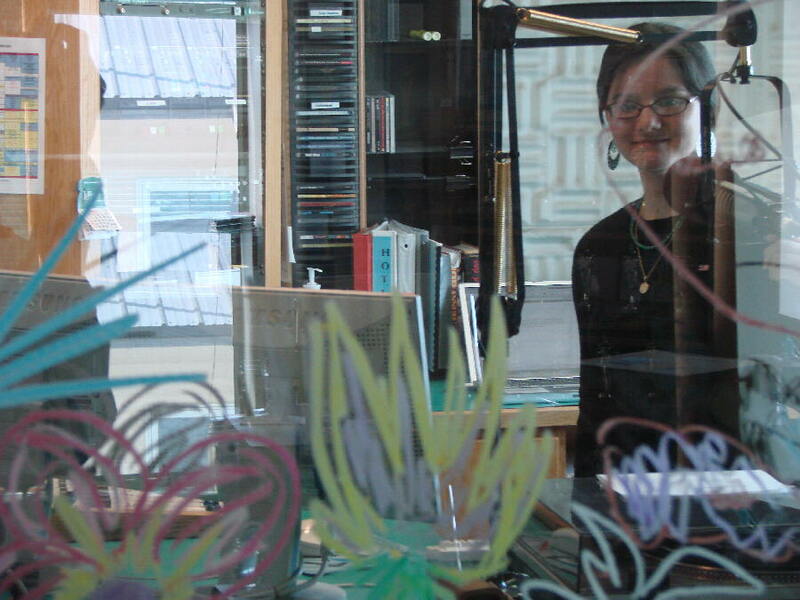 (left) KNOM volunteer production director Kristina Proctor gazes through the Studio A window. With the ground still covered with snow, program director Kelly Brabec, with help from Betsy Brennan’s young daughter Sarah, has drawn colorful flowers with crayon to bring a bit of cheer to the landscape. (Left) Kelly and Sarah show off their handiwork. Typically, you’ll see the first genuine greenery and the first flowers on Nome’s tundra around the third week of June. In total, our mission airs about 2,800 educational spots every month (and an equal number of inspirational ones). General manager Ric Schmidt continues the popular “Today in History” educational spots, recording a unique one for each day. The series’ exact origin has been lost to memory, but it has been a KNOM tradition for at least 25 years. That’s over 9,000 individual spots! WHY KNOM? The KNOM mission exists to inspire, to educate, to provide positive companionship, to inform and assist, to bring the Rosary and the Mass into villages which rarely see priests or sisters. Name a negative statistic — suicide, poverty, accidental death to name just three — and you’ll find that this isolated region has the highest numbers in the United States. We are working hard to help people change that. By supporting our mission, you are directly aiding thousands of families every day to improve their lives. Thank you for being there for them, for playing such a crucial role in supporting the oldest Catholic radio station in the United States. Thank you! INSPIRATIONAL SPOT: Don't try to give God orders. Just report for duty! 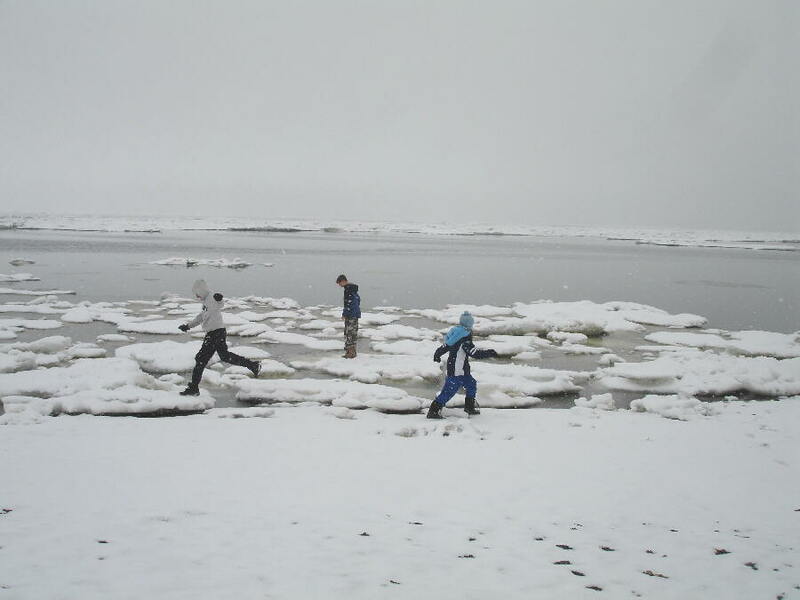 AT THE HOP: (left) In the last week of May, three of Ric and Lynette Schmidt’s children hop across ice chunks, as the frozen Bering Sea begins to melt. Please don't be alarmed. At the shore, where the young ones are playing, the water is only about a foot deep and the ice is firmly rooted to the bottom. A GAS: Since October, Nome has been paying $4.29 a gallon for gasoline. Its next price will be established when fuel is delivered by oceangoing tanker in July. People in the know think Nome’s gasoline will cost six to eight dollars by then. MEANWHILE, since Nome’s electricity is generated by diesel fuel, the price has skyrocketed. At our transmitter site, we are paying 29.4� per kilowatt-hour — about $7,000 per month for the transmitter alone. Nome Joint Utilities estimate that the price will rise by about 25% this summer. Thank you for your continuing help as we struggle to pay our bills. SUMMER? Not quite yet, but Nome did make it to 50� on May 12th, about a week earlier than on average. There was still plenty of snow on the ground. A FAWNING ANNOUNCEMENT: This is the time of year when a large herd of reindeer fawn on the tundra about nine miles north of Nome, and over KNOM last month, you’d hear announcements cautioning people to watch out for the animals, as the new moms are strongly protective of their babies. ROADLESS? Yes, Nome is more than 500 miles off the North American road system. A CALL FOR VOLUNTEERS: About half of the KNOM staff are full time volunteers, who commit their lives for a year or more. If you know an outstanding young person whom you think might be able to contribute and benefit in this way, please have them e-mail belong@knom.org. Thank you again for your generous help. We pray every day for you and your intentions. May God bless you and those you love abundantly.